Does social media really give a company any ROI? Can non-promoted content give returns? If yes, can it be measured at all? These are some of the questions I’m going to try and answer in this article. As someone who works closely with both the marketing and analytics side of social media, I know how tough it is to answer when the boss asks what was achieved for all the money that was spent. If, after multiple attempts, you’ve still not been able to convince the top management on social’s worth, it’s maybe time to reply with a question: What are they looking to get out of social? Does something as simple as a #TBT campaign need a goal? YES! Your goal could be as basic as spreading awareness or as complex as trying to increase online purchases, but defining them makes it a lot easier to run and assess a campaign. I’ve compiled 8 ways you can define campaign goals and measure them. I’ve also included data-driven examples of such content and ideas to help you mathematically present ROI. What this goal means in the bigger picture: Not all information can be shared in one go. To give interested readers more information, and in B2B marketing to qualify viewers invested in what your brand has to say, giving them a link that goes further into the topic makes sense. A link click or website visit builds traffic to your website. It is also a good way to make long form content more palatable. How to optimize content for goal: The link is king here. Your content shouldn’t be text or media heavy. Make sure the link you share has a relevant featured image, a clear headline, and a sharp meta description to attract more clicks. How to measure ROI: Measure ROI by calculating the increase in website traffic and track influencers that shared the page and spread digital word of mouth. What this goal means in the bigger picture: Cross-channel marketing goals such as survey participation or gathering user information through can be achieved through website action. How to optimize content for goal: Start off with a similar tactic of making the URL more visible. Additionally, mention the time you anticipate they’d spend on the website or number of actions they would have to take. Letting the viewer know upfront how much time they’d have to invest in the exercise is more likely to encourage them to get involved – much like how lists catch the eye better than other headlines. How to measure ROI: In the examples given above, it’s easy to measure ROI. 1. Roundup the total number of new signups on the website through the campaign. 2. Calculate earnings by using the lifetime value of an average customer. What this goal means in the bigger picture: User participation goes beyond engagement. Crowdsourced content is a soft endorsement and an easy way to gather recommendations or user stories. This content contributes to the positioning of the brand and adding credibility, which in turn works in increasing sales. How to optimize content for goal: Ask and you shall receive. Think I’m being preachy? Not really. Tweets that explicitly specify the action you expect the user to take gets better participation. Salesforce found that tweets that ask followers to “retweet” receive 12X higher retweets than those that don’t. How to measure ROI: Unlike website action, this ROI might not be measurable in numbers. Econsultancy recently did an entire research piece to show how UGC is changing content marketing. The research references a Reevoo study and says that 70% of consumers place peer recommendations and reviews above professionally written content. “Airbnb reviews have increased by 140% over the past year, showing the alternative hotel company’s explosive popularity, and proving that even a stranger’s opinion is more valuable than a company’s sales messaging.”, says Sophie Turton. A study found that 7.2% of all purchases are being made online and Nielsen found that 43% of online shoppers use social media as a research tool to make purchases. With UGC giving your brand that much more credibility and indirectly encouraging sales, the investment is sure to give returns in the long run. What this goal means in the bigger picture: Increasing brand recall and cementing an emotional connect. How to optimize content for goal: Depending on the core content, you awareness campaign needs to be tailored. A brand could run a variety of campaigns: CSR, product launch or season based promos. One of the best examples is Dove’s “Real Beauty Sketches” campaign. The use of video to portray the insecurities of real women and adding in a subtle brand plugin to show how the brand isn’t about vanity was a great positioning campaign for the brand. How to measure ROI: According to The Lenskold Group / eMedia Lead Generation Marketing ROI Study, even mass media experts don’t seem to have a comprehensive approach to ROI measurement from online campaigns. “Brand awareness does not have a financial value on its own but is part of the collective effort necessary for marketing to drive incremental sales.”, says Jim Lenskold in his article where he suggests different approaches to help marketers measure ROI from awareness campaigns better. With digital media, this measurement might get simpler. An increase in online searches post a campaign, community growth, increase in positive sentiment on your social media page or even increase in comments are varied digital currencies to measure ROI of your awareness campaign. The ROI on this goal is easier to measure when split by the specific metric your brand is trying to reach – Likes or Shares or Replies or any other metric your brand guidelines deem valuable. What this goal means in the bigger picture: Engagement translates to better reach, brand recall and audience approval. How to optimize content for goal: Start with a thorough understanding of your audience’s demographic and preferences based on historic behavior. Engaging content can’t be created with a single formula. Data-driven inspiration is the way to start. For example, Unmetric’s Inspire tool allows you to search for content based on a specific keyword in a specific industry or geography based on your content brief. I checked out automotive brands in North America that talk about speed. Likewise, researching competitor content is sure to give you a better idea of what will engage well. Secondly, you can look back at your own content to see what performed better. 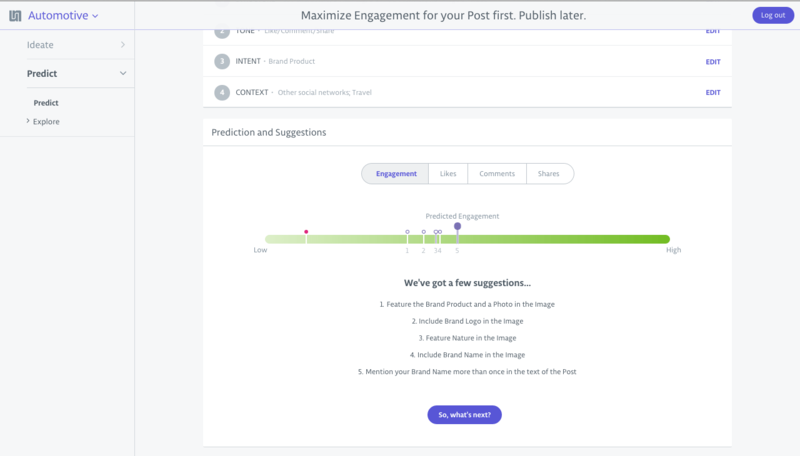 Finally, not to boast, think of it more as a humble brag, Unmetric’s latest tool allows you to enter a precomposed message in our tool to predict engagement and also prescribe suggestions to help your post engage better. How to measure ROI: Much like with awareness, measuring ROI on engagement is complex. Use engagement as a metric to calculate impressions, campaign reach and brand perception. Like I mentioned in the beginning, if you aim specifically for a certain metric like Favorites or Comments, it gets easier to measure. What this goal means in the bigger picture: More revenue! Although online sales is the simplest yet most valuable ROI generator, it works on multiple levels. It increases traffic, piques shoppers interest and popularizes your products. How to optimize content for goal: As cliched as this sounds, make the price, discount and image stand out. However, brands have been experimenting and found success in a format where you post an image of the product with simple text and a link. How to measure ROI: This is the easiest to measure. Create custom UTM codes and combine that with data from your e-commerce platform, this will help identify the income your social content generated. Google’s free URL builder is the best. What this goal means in the bigger picture: Brand apps irrespective of which industry they’re from, have a monetization plan. Whether it’s direct revenue generation through in-app purchases or community expansion through freemium offerings, brand apps are usually designed with their own goals. Social media content helps in transporting your digital audience to your app. 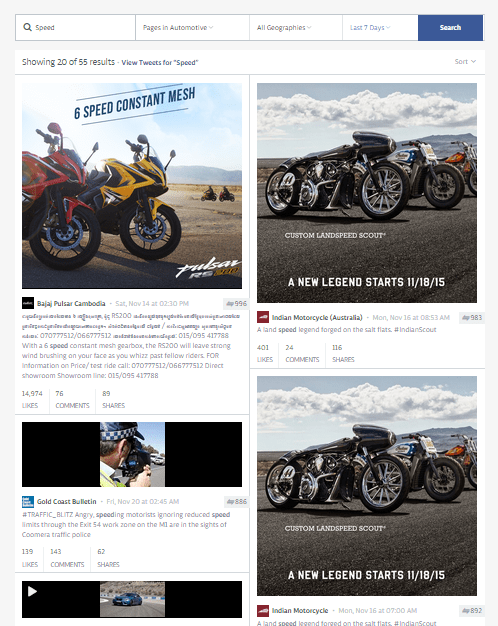 How to optimize content for goal: Social networks themselves allow brands to optimize sponsored content for different operating systems. If you’re not sponsoring the content, remember to clearly mention the name of the app so searching in the app store is easy, or better provide a link. A giveaway will work wonders. A Jeff Bullas recommended way is to leverage influencers to spread the word. Unmetric allows you to view a list of your most popular and most loyal influencers. Reachout to these people to present trusted recommendations. If your app has a revenue generation plan, crunching the numbers and arriving at the average value of every download can help in zeroing down on the exact revenue your social media content generated. What this goal means in the bigger picture: Footfall increase to your retail space which will automatically lead to revenue. How to optimize content for goal: Incentivize. Make your audience feel special, give them a reason to visit your store. Discounts or exclusive offers are a good way to get started. You could even ask the social users to check-in to your store or share content to make them eligible for certain privileges. Another smart tactic would be to leverage the right tweet times. If you’re a retail brand, publishing in the evenings or weekends (the prime shopping hours) might get your content more visibility. If you’re a restaurant brand, posting offers or menu addition at meal time makes more sense. In the chart below of Burger King’s tweet timings, we can see that the brand posts most proactively in the afternoon and also gets good engagement then. How to measure ROI: Using an exclusive promo code of sorts will make it easier to pinpoint the visitors that social media has sent to your store. If that’s not good enough, Propelrr suggests a closed loop uber funnel to map a customer’s journey. In conclusion, there are definite ways to measure ROI from social media content, you only need to be sure of what ROI means to you. As with any marketing campaign, there are many routes your content can take to make it more audience friendly. Irrespective of what creative theme your campaign follows, minor tweaks are all that’s required to make them social media friendly. In an age when digital content is taking over all other channels of marketing, it’s time for marketers to adapt and grow. The next time someone questions social media ROI, you’ll know to ROFL and give them a data-powered answer.